The traditional shitamachi area is located along the banks of the Sumida river (Sumidagawa). This river branches from the Arakawa river and flows for 23.5 km right through Tokyo, as the city’s most important waterway since the city became the capital of Japan at the start of the Edo period. You might be a little bit disappointed if you expect a very nice and historic riverside. The river itself is very wide (150-200 meters) and is mainly interesting in terms of a sort of industrial past and the essential waterway it represented in the old days. Some of the large and famous Japanese companies used to have factories alongside the river. For example Seiko used to manufacture its first watches here. Another large company, Kawasaki, established in 1878 the Kawasaki Tsukiji Shipyard on the river banks. This industrial activity is now gone, and has been replaced by a hodgepodge of office and residential buildings. On a very large part of the river, an elevated highway keeps the river company, side by side. One of its main features are the 26 bridges spanning the water. Most of them are built in the 20th century, replacing historical wooden bridges. The 1923 Great Kantō earthquake and the increase in traffic contributed to get sturdy steel bridges built over the river. View from the Sumidagawa on the rainbow bridge. There used to be 3 main bridges over the Sumida river in the Edo period. The most famous bridge is the Ryōgoku Bridge (両国橋), it was a beautiful wooden bridge built in 1660 and made famous with a ukiyoe print by Hiroshige. It was the first bridge in Edo times, which means for the first 50+ years in the Edo period only ferry services were available. Unfortunately the current one, built between 1930 and 1932, is not so visually appealing as the one the came before.The second bridge is the Shinohashi bridge (新大橋). The third is the large Eitai bridge (永代橋) built in 1696. At a later stage in 1774 the Ookawa bridge was built (the river used to be called Ookawa, meaning big river). The Sumida river is the main backdrop of one of the biggest and oldest fireworks displays in Japan. Each summer there is an intense competition between rival pyrotechnic groups to deliver the best fireworks display. This tradition dates back to 1732 as fireworks that was part of festivals for the dead. The next fireworks are on 29 July 2017 and 28 July 2018. Fireworks over the Sumidagawa river. Along side the river there are several things to see and do. It is a pretty interesting walk to go up and down the river and explore the bridges spanning the river, each with their own unique history. For tourists, the quickest way to get around is by taking one of the many boats or cruises that are available from Asakusa. The most popular is the water bus (水上バス). Among the many lines that are on offer I recommend the Sumida river line that connects Asakusa with Hinode, and makes a stop at the Hama Rikyu gardens (please note that when you get off at the gardens, you need to pay JPY 300 entrance fee. 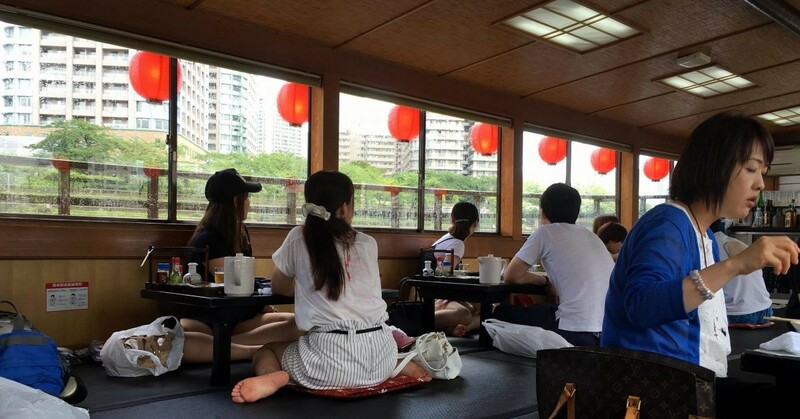 This boat trip takes 35 minutes and costs JPY 740 (about 10 boats per day). 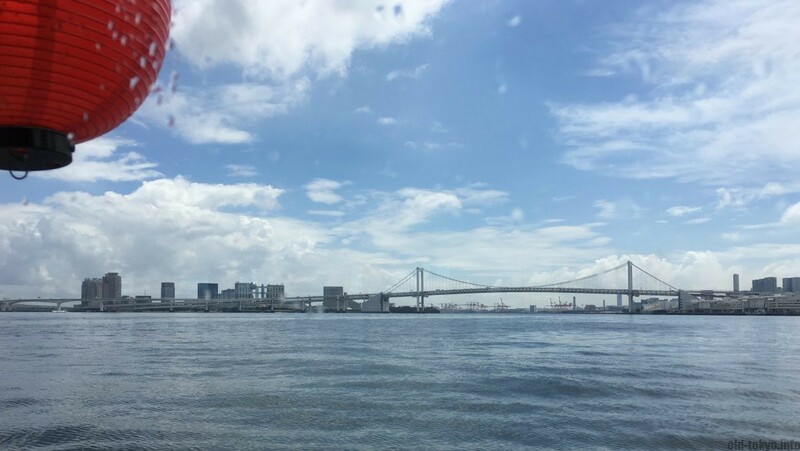 Another popular option is the Asakusa-Odaiba direct line (JPY 1560 for 50 minutes, 2-4 boats per day), which will take you to Odaiba. The Himoko and Hotaluna boats look a bit like spaceships, giving you great panorama views. On the Yakatabune cruise boat. If you would like to do more than just go from point A to B, you can take a cruises that will return to your departure point and usually involves lunch or dinner and take about 2 hours. Rather than a cruise, this type of activity is more like a party on the river. They are organised in traditional Yakatabune, a unique Japanese-style wooden tour boat, in which you often sit on the floor on plastic tatami mats, and you receive the same experience as if you go to an izakaya (Japanese pub). Cruising the river in this way was pastime among rich merchants and high-ranked samurai in the Edo days. After having participated in one, I feel the goal was not really to see the river and surroundings, rather the goal was to chat, drink and, indeed, party. There are about 29 yakatabune companies, each offering slightly different plans. The Sumidagawa can be easility reached from Asakusa, Kuramae, Ryogoku, among other locations.